Get ready to LAUNCH your kids into successful adult life. To “Look Inside” the book on Amazon for free, click here. To access the free bonus book updates, click here. $34.99 plus shipping (for information that could save you $50,000 on college costs). Includes 344 pages and bonus updates. You’d love to get your kids through college debt-free — but your kids aren’t getting any scholarships, you haven’t saved for college, and you make too much to get government financial aid. Is there still hope? Yes, but you’ll need someone to guide you. In LAUNCH, academic strategist Jeannie Burlowski lays out clear, step-by-step strategies that empower and inspire parents to get their kids through high quality, best-fit colleges debt-free — and then directly into jobs they love afterward. Get all the information you need most, and get it fast. 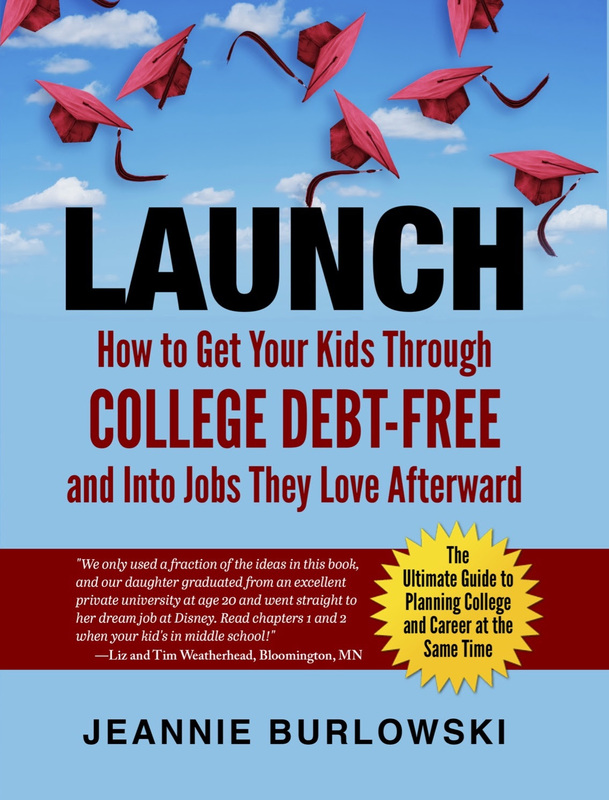 As a parent, all you’ll need to do is read just one chapter of LAUNCH every 1-3 months while your child is in middle school and high school — and you’ll know every viable strategy for debt-free college at exactly the right time to implement it. And if your child is already well past middle school? That’s OK; you can run to catch up. But the process of getting your kid through college debt-free goes more smoothly the earlier you start it – especially if you’re not planning to save up any money to pay for college. 1. Twelve things you can do right now to put your kids on the fast track to getting through college debt-free — whether your child’s in high school or in diapers. 2. Why pressuring kids to “get into a good college” and then pushing them to take on suffocating debt to pay for it is not the fastest, best route to career satisfaction and future financial stability. 3. How kids as young as age 15 can get an exciting, liberating sense of possible career goal early on, and then sign up for only the amount of college absolutely necessary to accomplish that. 4. How kids as young as age 12 can get a massive head start on racking up the 10,000 hours it takes to be viewed as expert in a career field. 5. Plus over 100 viable, practical debt-free college strategies that nobody else is talking about. Order bulk quantities of LAUNCH for your school, college, philanthropic organization, or business. If you’re a Certified Financial Planner, you remember the days when financial planners would focus mostly on parents’ retirement, leaving college planning to high school guidance counselors. No financial planner wants to spend three years figuring out all the zillions of ways families can keep college costs down, though. Neither do financial planners have time to spend 100 hours explaining these strategies to parents. What financial planners need is one book they can hand to parents. One empowering, inspiring book that provides moms and dads with clear step-by-step instruction, so parents can set their kids up to graduate college debt-free and move directly into careers they excel at and love. Even if those parents can’t save up ahead of time and don’t qualify for financial aid or scholarships.